In an ideal world, you’d know about employee absences weeks or even months ahead of time. 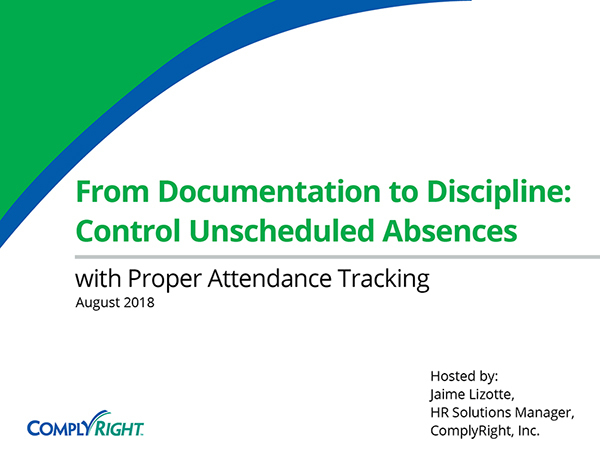 For regularly planned absences, make sure all supervisors and direct coworkers are in the loop regarding the dates your employee will be gone. But what about other kinds of absences, where you only have a few hours’ notice or no notice? The U.S. Bureau of Labor Statistics reported that unplanned absences cost employers 2.8 million work days last year. The bulk of these absences occur during the winter and summer months, when commuters are affected by bad weather and kids are on breaks from school. How Can You Manage All of These Unexpected Absences? As the saying goes, the best defense is a good offense. Distribute a memo or email reminding employees of your attendance policies and any disciplinary actions for not adhering to those policies. Encourage your employees to request time off in advance to avoid any conflicts. Certain things will always fall outside your control. If an employee phones in the day of (or night before, if you’re lucky) an incident, don’t react immediately and deny the request. First, figure out if it can be managed. Are there any pressing deadlines or meetings? Can someone else take over the employee’s work for the day? If something requires immediate attention, ask if the employee can take a half-day instead — or if he or she can work remotely to address the most important things. Before you deny any last-minute requests, consider how the employee might feel or act if he or she is forced to come in to work. If it’s an emergency, your employee’s mind won’t be at work, even if he or she is sitting at a desk. Also, before you discipline an employee because of an unexcused absence, make sure the absence isn’t for a reason protected by federal, state or local law. What if there’s no phone call, e-mail or employee? First, check in with his or her supervisors to rule out a scheduling change or out-of-office meeting you weren’t aware of. Make sure you document the absence if the employee is out for the day. Discuss coverage with his or her supervisor to ensure the work is covered. Also look at the possibility of whether someone else can perform their job in their absence? Can meetings or deadlines be pushed back? If your employee returns to work, discuss your attendance policy and the importance of calling in to the supervisor prior to their shift starting. It would also be good to go over the policy on “no-call/no show.” Employees who violate “no-call/no show” procedures without a valid reason should be subjected to formal discipline. Be sure to apply disciplinary action consistently, however, to ensure fairness and prevent discrimination claims. If your absenteeism issues aren’t seasonal, you should consider revising your vacation or absence policy. It is important to establish a policy that is both fair and consistent. You must ensure that you follow the same steps when disciplining employees for tardies and/or absences. Some employers follow a system of occurrences that allows you to have consistency in how you handle them. For example, late arrival is one half of an occurrence and an unplanned absence is one occurence. If an employee has, for example, three occurrences in one month, you can start a progressive disciplinary process where they get a verbal warning and it progresses to a formal written warning as the occurrence increase. Other employers choose to reward perfect attendance with bonuses, gift cards, PTO or some other kind of gift – or they take attendance into consideration when determining promotions or raises. Finally, you should take a careful look at your organization and make sure poor morale or lack of engagement isn’t contributing to your absenteeism issues.